Thousands of CWA members in more than 30 cities across the country took to the streets on Saturday for the Working People's Day of Action to demand an end to an economy that's rigged in favor of the wealthiest and most powerful. The day of action came as the Supreme Court began hearing a court case called Janus v. AFSCME Council 31. This case is the culmination of decades of attacks on working people by corporate CEOs, the wealthiest 1%, and the politicians that do their bidding to rig the economy in their favor. For more details, see The Truth About Janus v. AFSCME Council 31. "It was a great show of solidarity," said Nick Kwapil, Secretary of CWA Local 4611 in Kenosha, Wis. "Unions and our movement are gaining more public support. People are tired of what's been happening in the state of Wisconsin, and the current Trump administration has been the catalyst we needed to get a strong push as a united Wisconsin, fighting against union busting efforts from the GOP. People and unions are fighting back!" Wendy Anderson, a member of CWA Local 7201, said: "It doesn't matter if you're in the same union as me. We're brothers and sisters, and we support each other." Dave McCune, President of CWA Local 4502 in Columbus, Ohio, said, "It made me feel energized. Seeing so many of my brothers and sisters standing in the pouring rain helped get me fired up and ready to fight!" "Today is a day of action, but we need to make it the first day of action, not the last day of action," said CWA President Chris Shelton, firing up the crowd at a rally in Washington, D.C. "We need today to make sure that the Supreme Court understands that this is going to be a war – and we are not going to lose that war." Click here to watch President Shelton address the crowd. The potential effects of a negative decision will be felt at every level of CWA and the labor movement as a whole. That's why we're fighting back – through the CWA STRONG program, which strengthens our union at all levels. Austin. St. Paul. NYC. San Diego. Columbus. Chicago. St. Louis. Thousands of CWA members in more than 30 cities across the country took to the streets on Saturday for the Working People’s Day of Action to demand an end to an economy that's rigged in favor of the wealthiest and most powerful. More photos here. Janus v. AFSCME Council 31 is a Supreme Court case that aims to take away the freedom of working people to join together in strong unions to speak up for themselves, their families, and their communities. The case started as a political scheme by the billionaire governor of Illinois, Bruce Rauner. He launched an attack to reduce the power of public service workers immediately after taking office, filing a lawsuit to bar the collection of fair share fees by public service unions. The National Right to Work Foundation, a network funded by corporate billionaires that uses the courts to rig the rules against everyday working people, took up the case and put it on the fast track to the Supreme Court. Unions work because we all pay our fair share and we all benefit from what we negotiate together. Fair share fees provide public service workers, including more than 100,000 CWA members, with the power in numbers they need to negotiate better wages, benefits, and protections that improve work conditions and set standards for everyone. The simple truth is that no one is forced to join a union and no one is forced to pay any fees that go to politics or political candidates. That is already the law of the land. Nothing in this case will change that. This case is about taking away the freedom of working people to come together, speak up for each other, and build a better life for themselves and their families. CWA has been preparing members and bargaining units for a negative decision through the CWA STRONG program. 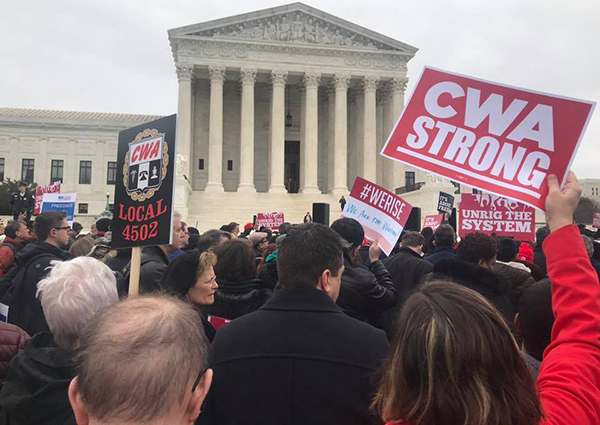 CWA members rallied at the U.S. Supreme Court on Monday to fight for the freedom of working people to join together in strong unions to speak up for themselves, their families, and their communities. Citing concerns about layoffs and the use of contractors that has resulted in job loss and reduced service quality, CWA-represented Frontier workers throughout West Virginia and in Ashburn, Va., are prepared to strike if substantial progress is not made on contract negotiations before the current contract expires at midnight on Saturday, March 3. "Frontier promised West Virginians that they would continue to provide the high quality service that is critical for families and businesses across the state," said CWA District 2-13 Vice President Ed Mooney. "Instead, what we have seen is a sharp increase in customer complaints that has coincided with job cuts. There are simply not enough employees to get the job done." "West Virginians are tired of being left behind, and working people like us are fed up," said Jeff Anderson, President of CWA Local 2004 in Fairmont, W.Va. "How can we provide opportunities for our kids and keep businesses in our communities if we don't have a well-run modern telecommunications system? And how can Frontier provide good service to its customers if they keep cutting jobs?" Workers at Avaya voted overwhelmingly to extend the current contract until September 21, 2019. All current provisions remain in effect, with the addition of a wage increase. Employees at the Casper Star-Tribune voted in favor of joining the Denver Newspaper Guild-CWA, the first time workers at Wyoming's statewide paper have joined together to form a union in its 127-year history. "Our goal is to protect and strengthen the future of the Star-Tribune, as well as Casper and Wyoming's news, for many years to come," said the Casper Star-Tribune’s organizing committee in a statement. Three CWAers testified at an Illinois General Assembly hearing this week in support of legislation to protect Illinois call center jobs. Holly Sorey, President of CWA Local 4202; Dea Polchow, Executive Vice President of CWA Local 4202; and Celia Cody, Illinois CWA Staff Representative spoke at the hearing about how call centers are an important economic lifeline for many communities in Illinois and across the country. But thousands of call center workers have lost their jobs in recent years as major corporations, such as AT&T and Capital One, have offshored customer service operations to cheaper markets overseas. This trend has harmed working families and communities in Illinois and across America, while endangering consumer security and hurting customer service. The Call Center Worker and Consumer Protection Act, sponsored by State Representative Mike Halpin, would create a list of companies that move call centers out of the state and make these offshoring companies ineligible for certain tax preferences and grants and loans for five years. The bill would also require state agency contracts for call center services be performed entirely within the state of Illinois. Left to right: Executive Vice President of Local 4202, Dea Polchow; Andre Ross, Skyler Martin, and Aaron Beckman show their support for legislation to protect Illinois call center jobs. President Trump's tax bill is a massive giveaway to the wealthiest and the top 1%, paid for by working families. But that's not all the awful policy contained in the tax bill; also hidden inside are actual incentives for companies to offshore jobs. Now, Democrats in Congress are rolling out legislation to crack down on these offshoring incentives and keep jobs in the U.S. Congressman Lloyd Doggett (D, TX-35) and Congresswoman Rosa DeLauro (D, CT-3) this week introduced the No Tax Breaks for Outsourcing Act with Senator Sheldon Whitehouse (D-RI). The legislation, which CWA supports, would level the playing field for domestic companies by ensuring that multinational corporations pay the same tax rate on profits earned abroad as they do in the United States. The bill would end tax incentives created by President Trump's tax law to outsource jobs and shift profits offshore. A federal court ruled this week that CWA, Public Citizen, and the Natural Resources Defense Council (NRDC) have not yet shown that President Donald Trump's executive order requiring federal agencies to repeal two regulations for every new regulation issued is causing the sort of injury that permits them to pursue their challenge to the order in court. CWA President Chris Shelton said, "Trump's executive order is a big favor to big business, and it puts workers' lives at risk. Health and safety regulations are written in the blood of working people, and this executive order treats those lifesaving rules like bargaining chips. Essentially, it tells workers: If you want to be free from asbestos, you'll need to contend with lead poisoning or infectious disease, because Trump's friends in the corporate world can’t be bothered with obeying commonsense health and safety rules. We shouldn’t have to wait for a member to get sick, or injured, or die because of this executive order before the courts will take action. We’re disappointed in the court's decision, but we’re not backing down from representing our members and defending workers' lives." The court indicated that it may give CWA, Public Citizen, and the NRDC an opportunity to provide more evidence that the executive order is causing harm. CWA, civil rights, and public interest groups filed comments urging the Federal Communications Commission (FCC) to preserve the Lifeline program. The FCC's proposals are attacking the country's poorest communities by attempting to gut a program that helps almost 9 million low-income households pay for communications services. Late last year, FCC Chairman Ajit Pai began his newest assault on the Lifeline program, which addresses the high cost of broadband service and helps close the digital divide. CWA urged the FCC to reject proposals that would weaken the Lifeline program. Read CWA's full comments here. 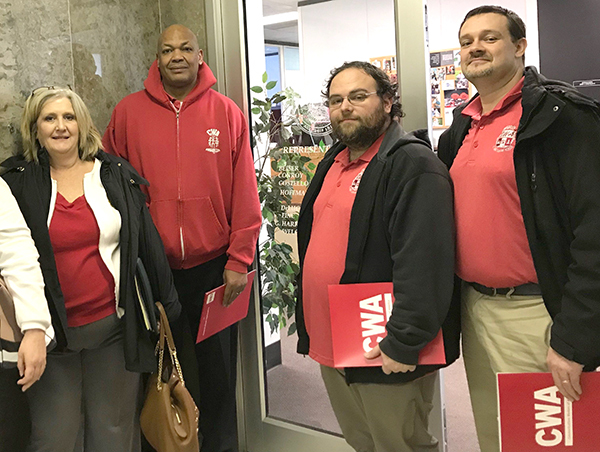 CWA members participated in a day of action on February 27 to urge Congress to use the Congressional Review Act to pass a "resolution of disapproval" as a first step toward legislation that would protect an open internet. 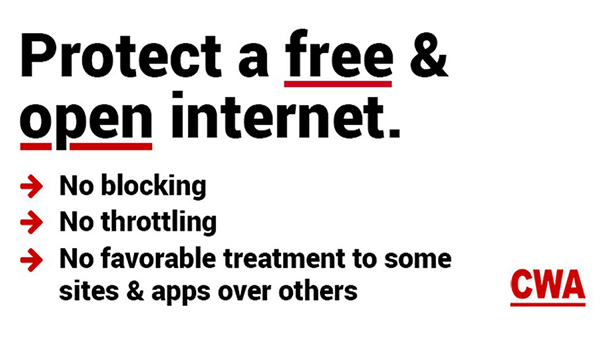 We need clear, enforceable rules to protect a free and open internet for everyone while promoting job-creating investment in broadband networks. The FCC should have the authority to enforce any violations. Instead of clear, common sense rules of no blocking, no throttling, and no favorable treatment to some websites, we now have a "trust me" approach that is ineffective and meaningless.